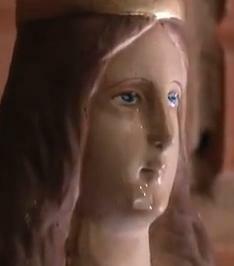 Visions of Jesus Christ.com - Our Lady cries, Puerto Iguazu, Argentina. December 19, 2011 - Translated from Spanish. View/watch videos of these event [here], [here] and [here]. The incident reportedly began Sunday afternoon. A statue of the Virgin of Caacupe, in a private house.The statue Virgin of Caacupé, is located in the house of Rumilda Martinez, in the High district Villa of this city, on the Rowed street Felix 712. 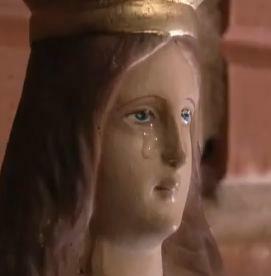 “It was Sunday near the 15:00 when the strange event began, my daughter could see how tears on the face of the Virgin fell. 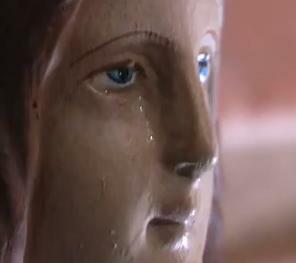 When I watched the Virgin and saw how she cried, we embraced and we cried. The family has had the Virgin statue for 3 years, where in addition they made a room like a sanctuary with Saint and Virgin Mary images" From yesterday, many people as much as could fir congregated in the humble house of the High district Villa to pray to the Virgin and burn candles. 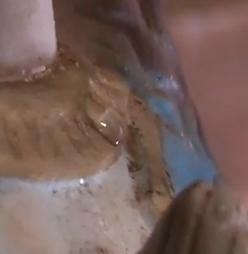 According to Martinez commented, the children approach to touch the tears and the devotee ones shocked approach to say the rosary. 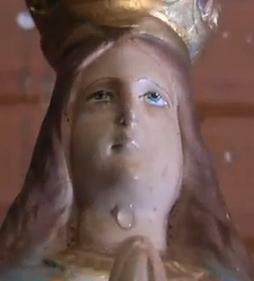 [See here] The Virgin cries blood in Iguazú and Lagrimea.